Finally, the much anticipated FJ-09 has arrived! Designed around the concept of a "Versatile, Sporty Multi-Use machine", the FJ-09 offers a comfortable and exciting ride whether taking a relaxing tour or hitting the hustle of the city on your daily commute. An upright riding position, wide handlebar and all new seat design combine with the exciting power of the 3-cylinder Crossplane Concept engine to create a machine that will leave you grinning after every ride. CF (Controlled Filling) die cast, twin spar, diamond-type, aluminum frame provides an optimized rigidity balance for incredible handling performance combined with great stability. The engine is a stressed member of the chassis, allowing a lighter, more compact main frame design without sacrificing rigidity or agile handling qualities. 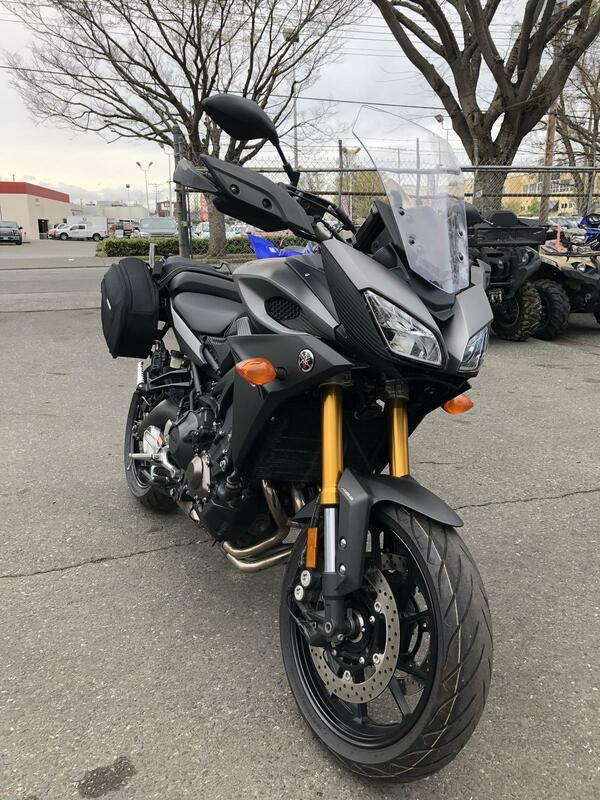 The riding position is one of the most important features of the FJ-09 chassis, offering a balance between sporty handling and excellent rider comfort thanks to its upright seating position. Key chassis geometry figures include: 1440mm (56.7") wheelbase, 24 degrees of rake and 100 mm of trail. The front to rear weight distribution is 51 - 49% and the lean angle is 51 degrees, highlighting the sporty nature of the FJ-09. The chassis dimensions and shape have been designed to enhance the qualities of the 3 cylinder engine and to centralize mass and lower the centre of gravity to provide the rider with "the pleasure of controlling the bike at will"
Revised, detachable, round tube steel rear sub frame has been designed to withstand the extra load and forces applied during light adventure touring. It is one of the mounting points for the accessory hard saddlebags. It also allows easy access to rear suspension components and reduces costs in the event of accidental damage. The sub frame features corrosion resistant electrostatic paint process. Lightweight, externally mounted, C.F. (Controlled Filling) die cast aluminum, truss-type rear swingarm offers great rear wheel control and traction for razor-sharp cornering and superb stability at speed. Adjustable 41 inverted cartridge e style fork offers 137mm (5.4") of wheel travel. The fork can be adjusted for spring pre-load and rebound damping. The benefits of the inverted design include: reduced "unsprung" weight and reduced fork flex since the larger diameter tubes are gripped in the triple clamps. The adjustable design allows the rider to tailor suspension settings to match rider weight, road conditions and riding style to maximize handling and suspension performance. Lightweight, cast aluminum upper and forged aluminum lower triple clamps. Adjustable link-type Monocross rear suspension. The rear shock can be adjusted for spring pre-load and rebound damping. The adjustable design allows the rider to tailor suspension settings to match weight, riding style and road conditions. Shock is almost horizontally mounted to centralize mass and reduce the centre of gravity for light, agile handling. Rear wheel travel is 130mm or 5.1"
ABS equipped dual 298mm floating front discs are squeezed by ultra-rigid, 4-piston monoblock calipers. The master cylinder features a 16mm piston for outstanding stopping power with less lever effort. Braking performance is excellent and offers good "feedback" to the rider. ABS equipped 245mm rear disc is squeezed by a lightweight single piston slide-type Nissin caliper with sintered metal brake pads. The Anti-Lock Braking System (ABS) features Yamaha's latest generation independent linear controlled system with step-less, infinitely variable hydraulic pressure adjustment. This system uses the same wheel sensors as the traction control system, further reducing weight. When the ABS system senses impending wheel lock-up, the system regulates the hydraulic pressure to the point just before the wheel or wheels lock-up. The benefit of ABS is excellent control under hard braking or when braking on wet, slippery or loose surfaces. Lightweight, cast-aluminum 10-spoke wheels reduce unsprung weight for great handling characteristics. The front wheel is an MT3.50-17 and is fitted with a 120/70-ZR17 radial tire. The rear wheel is a MT5.50-17 fitted with a 180/55-ZR17 radial tire. New adjustable, tapered aluminum handlebar combines with the upright positioning for excellent all day riding comfort. The handlebar can be adjusted 10mm by simply turning the eccentric handlebar holders. The handlebar holders feature special threads for additional accessory installations. 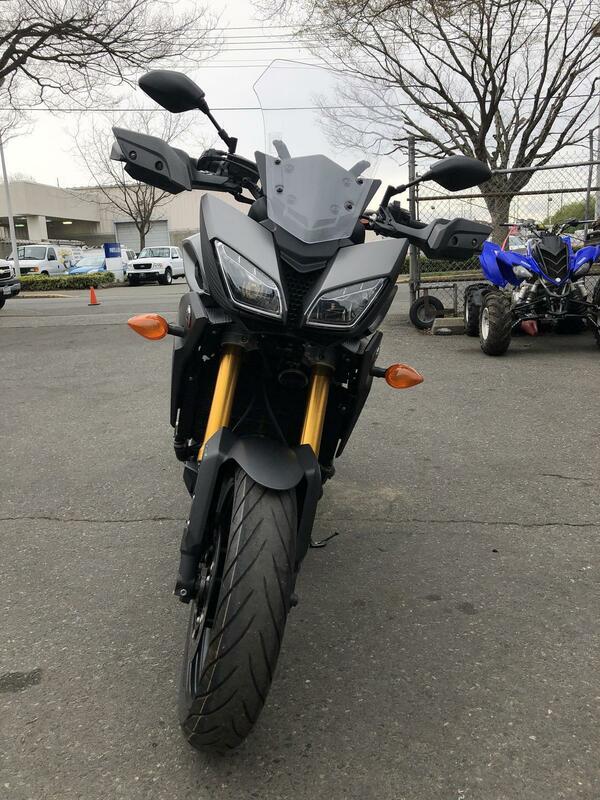 New hand covers (aka brush guards) offer good wind protection, add a styling highlight and offer some unit protection in the event the bike tips over. New, 18 litre fuel tank offers an extended riding range with great knee grip. It is made of steel, for ease of use with magnetic style tank bags. The reserve portion of the tank is 2.8 litres (when the low fuel light illuminates). The riding range should exceed 300 kms per tank. New, separate rider and passenger seats are designed for longer distance riding. 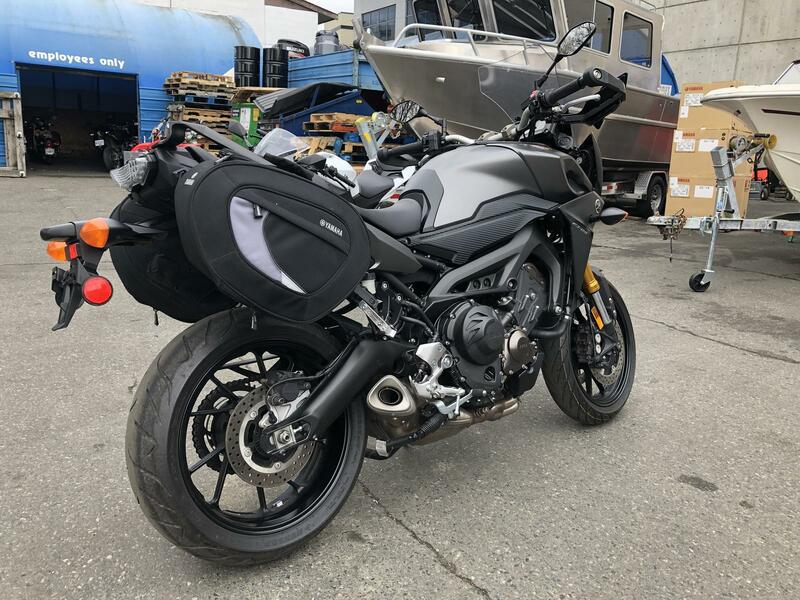 Both seats are longer than those on the FZ-09. The passenger seat is also significantly wider for improved passenger comfort. The rider seat offers 2- positions of height adjustability 845 mm in the low position and 860 mm in the high position. No tools are required to adjust the seat. All new, multi-function meter assembly. Left side features digital tach and speedo, plus fuel gauge, clock and status indicators for traction control, D-modes, and Eco System. The right side utilizes a DOT Matrix LCD display, which includes odometer, dual trip meters, outside air temp, coolant temp, instant & average fuel consumption, estimated travel range (based on remaining fuel), time trip and low fuel trip meter. Other functions include grip heater status (grip heaters are optional) and gear position indicator. All functions are controlled by buttons on the L.H.S. switch gear. There are also a full range of warning and indicator lights as well. The ECO indicator is a light that indicates the bike is being ridden in a manner that conserves fuel. Background illumination is adjustable. 12 volt DC outlet is conveniently located next the multi-function instrument. A second 12 volt outlet can be added if desired. All new, layered design front fairing offers cutting edge styling and good wind protection. The adjustable windshield features 37mm (1.5") of adjustment. Adjustment is easy and requires no tools. Newly designed centre stand for extra convenience when loading, unloading or servicing the unit. (Note: this part will not retro fit to 2014 FZ-09... no mounting tabs & muffler must be changed). All new eye catching LED headlights and LED position lights offer both excellent illumination and visibility. Easy access headlight adjusters for changing load conditions. Saddlebags and pre-wired hot grips will be offered as Genuine Yamaha accessories. Excessive lean angle sensor will shut down the engine in the event the bike is lying on its side to prevent engine damage. Fuel Delivery: Mikuni 41 mm throttle body F.I. Slim, compact, 847cc, DOHC, 12 valve (4-valves/cyl), liquid-cooled, 42.5 degree inclined, inline-three cylinder engine. The engine has been tuned to provide plenty of low to mid-range torque with strong yet linear throttle response. Downdraft style combustion chamber design features 4-valves per cylinder and an 11.5:1 compression ratio for excellent torque output. Intake valves are 31mm in diameter and exhaust valves are 25mm. The valve angle is set at 26.5 degrees (intake is 13 & exhaust is 13.5 degrees) to keep the combustion chamber compact. The stainless steel valves feature an Isonite surface treatment and carburized tips for improved durability and wear resistance. 120 degree crankshaft is used. This design reduces inertia torque while emphasizing linear torque development in response to the rider's throttle action. This design has been optimized to achieve strong torque over a broad rpm range as well as fast, strong, linear throttle response. This engine design allows a whole new level of "rider - machine communication". The engine features "even" 240 degree firing order. A lightweight "coupling force balancer" is used to reduce engine vibration for excellent rider comfort. "Fracture split" connecting rods feature a nutless design. The lower end "cap" of the rod is made from the same piece of material as the upper portion; this design is known as "fracture splitting". This design aids in establishing true big end roundness and greater precision in con rod dimensions for excellent durability despite the higher horsepower loads. Lightweight forged aluminum pistons. Lightweight design aids in fast engine response and reduced weight. During the forging process, the aluminum is heated to the point where it can be shaped under pressure in a die but not to the point that it melts. By not melting the aluminum, the material stays stronger and hence can be lighter with excellent durability. Direct plated cylinders are a "liner less" design with a ceramic coating sprayed directly on the aluminum block. This coating enhances the thin film of oil between the cylinder and pistons which reduces friction and increases power. Other important benefits include; excellent heat dissipation for consistent power delivery and reduced weight since there are no heavy liners. The cylinder is "offset" (5 mm to the exhaust side) relative to the crankshaft to reduce frictional losses between the pistons and the cylinder wall during the power stroke. One-piece cylinder and upper crankcase assembly provides superior engine rigidity and reduces weight. The engine is a stressed member, so it also increases chassis rigidity as well. Lightweight, hollow intake and exhaust camshafts are designed to provide strong low and midrange power and torque, in the most commonly used speed ranges. Mechanical "half nut" cam chain tensioner reduces mechanical engine noise and maintenance. This special design is a world's first for Yamaha and better controls the flexing of the tensioner spring. The benefits include fewer parts and a lighter, more compact design. Mikuni, 41mm, throttle body fuel injection system utilizes a throttle position sensor (TPS) and an acceleration position sensor (APS). Yamaha's chip controlled throttle (YCC-T) and D-Modes systems are also used. The injectors feature 12 holes and 20 degree spray pattern. The injectors are located such that the fuel is sprayed directly at the intake valve. This is a closed loop fuel injection system, with an oxygen sensor that monitors the amount of oxygen in the spent exhaust gases and adjusts the fuel -air mixture via the ECU and FI system for maximum performance with minimum emissions. The benefits of fuel injection include choke-free starting, steady idling during warm up, excellent fuel economy, and reduced emissions. The system has been "tuned" to provide excellent "ride ability" with "linear" throttle control. Yamaha Chip Control Throttle (YCC-T) system electronically controls the throttle valves for outstanding response and improved controllability at all rpms. The YCC-T is used to provide optimum control of the intake air volume for a smoother torque character. The YCC-T is capable of responding to changes at a speed of 1000th of a second. Yamaha D-Mode variable throttle control enables the rider to adjust the performance characteristics of the engine based on riding preferences or road conditions. Standard mode emphasizes the very linear throttle and torque feel of the engine. The A mode allows the rider to enjoy even sportier engine performance in the low to mid rpms. While the B Mode reduces throttle response for riding situations that require softer power characteristics, such as slippery conditions. The D-Mode button is located on the RHS handle bar switch gear. New traction control system works in conjunction with the YCC-T system. Utilizing front and rear wheel sensors, this system senses when the rear wheel begins to spin and modifies the YCC-T function, ignition timing and fuel injection to reduce power and eliminate wheel spin. The actuation button is on the multifunction instrument panel as is the status indicator / warning light. The traction control system helps maintain traction when accelerating on slippery surfaces. The system automatically is engaged when the ignition is turned on but can be turned off if desired. Compact Electronic Control Unit (ECU) utilizes a powerful 32-bit processor for fast control of the injection, engine management and ignition processes. The compact design reduces weight. Revised air box features dual resonator chambers and unequal internal intake funnel lengths for all 3 cylinders. The left cylinder funnel is 102.8mm, the centre is 82.8mm and the right cylinder is 122.8mm. The benefit is a wide torque curve and an exciting intake sound that accentuates the exhaust note. A viscous paper type air filter is utilized. Compact 6-speed transmission "stacks" input/output shafts to centralize mass and to keep the overall engine size shorter front to back. As a result, this allows the engineers the freedom to place the engine in the frame for optimum front to rear weight balance. The transmission primary reduction ratio is 1.681 and gear ratios are optimized to accentuate the torque and throttle response of the engine. Compact, wet-type heavy duty, multi-plate clutch ensures consistent, positive engagement. Revised, low mounted, 3 into 1 exhaust system features stainless steel header pipes with special "Nano-film" coating to help prevent rusting and discolouration. Revision is based on the fitment of the new centre stand. The muffler is a triple expansion type with a 3-way honeycomb catalyzer to reduce harmful CO and HC exhaust emissions. The low mounted design centralizes mass for excellent handling and a lightweight feeling. Lightweight flat design radiator for maximum cooling efficiency. There is a protector plate on the lower edge of the rad to prevent small stones from being kicked up into the fan. Lightweight, aluminum liquid-cooled oil cooler maintains stable lubricant temperatures for extended engine life. Convenient spin-on type oil filter. Convenient oil level sight glass means easy oil level inspection. Maintenance-free transistor-controlled digital ignition (TCI) ensures fast starts and great performance at all rpms. Air Induction System (AIS...not ram air) injects fresh air into the exhaust port to reduce harmful HC and CO emissions for a cleaner environment.